Risks of Nuclear Power: Nuclear power, or nuclear energy, is the use of exothermic nuclear processes, to generate useful heat and electricity. The term includes nuclear fission, nuclear decay and nuclear fusion. Presently the nuclear fission of elements in the actinide series of the periodic table produce the vast majority of nuclear energy in the direct service of humankind, with nuclear decay processes, primarily in the form of geothermal energy, and radioisotope thermoelectric generators, in niche uses making up the rest. Fukushima-Daichii nuclear power plant on March 16, 2011, after an 8.9 magnitude earthquake and tsunami set in motion a chain of disastrous events at the facility. 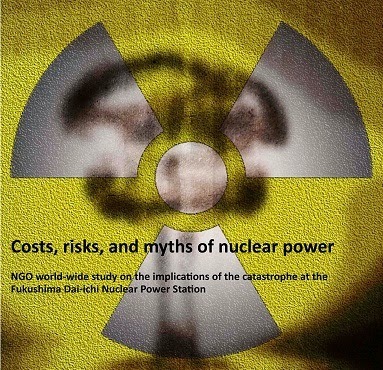 Here is some of Major Risks of Nuclear Power. Reactor accidents: The nuclear power plant design strategy for preventing accidents and mitigating their potential effects is "defense in depth"--- if something fails, there is a back-up system to limit the harm done, if that system should also fail there is another back-up system for it, etc., etc. Of course it is possible that each system in this series of back-ups might fail one after the other, but the probability for that is exceedingly small. Radioactive Waste: The radioactive waste products from the nuclear industry must be isolated from contact with people for very long time periods. The bulk of the radioactivity is contained in the spent fuel, which is quite small in volume and therefore easily handled with great care. This "high level waste" will be converted to a rock-like form and emplaced in the natural habitat of rocks, deep underground. The average lifetime of a rock in that environment is one billion years. If the waste behaves like other rock, it is easily shown that the waste generated by one nuclear power plant will eventually, over millions of years (if there is no cure found for cancer), cause one death from 50 years of operation. By comparison, the wastes from coal burning plants that end up in the ground will eventually cause several thousand deaths from generating the same amount of electricity. Mining uranium to fuel nuclear power plants leaves "mill tailings", the residues from chemical processing of the ore, which lead to radon exposures to the public. However, these effects are grossly over-compensated by the fact that mining uranium out of the ground reduces future radon exposures. By comparison, coal burning leaves ashes that increase future radon exposures. The all-inclusive estimates of radon effects are that one nuclear power plant operating for one year will eventually avert a few hundred deaths, while an equivalent coal burning plant will eventually cause 30 deaths.